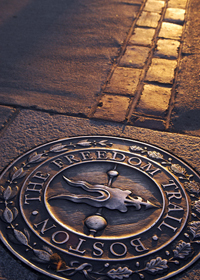 Years ago, when I visited the city for the first time, I happened on the the Freedom Trail, a self-guided walking tour. Having no better idea of how to explore the city (I had gone there on a lark, i.e., hopped in my pickup one day and thought, "East. I've never been East before. Go East, young man, say I. Go East"--I'm pretty sure that's a verbatim account. I chose Boston somewhere along the way only because I decided I wanted to see the actual art museum from whose actual store my condo was actually almost entirely decorated.) it occurred to me that beginning at the beginning, sort of, of our history, seemed like as good a place as any. I had no idea to expect anything other than some aerobic exercise and a congeries of historical factoids. But to my deep surprise, if the Boston Museum of Fine Art was my personal Mecca, the city itself was an unwitting hajj to the seat of my identity as an American, an identity, I might add, I never particularly knew I had or had ever given much thought to. A very typical American attitude, I suspect. Boston Common, Faneuil Hall, the Old North Church, the names, so familiar, on the gravestones at Granary and Copp's Hill burying grounds, Bunker Hill, the U.S.S. Constitution: These are places where men and women fought for an idea, a revolutionary idea, with words and deeds, in ink and in blood and birthed a land, the land of my birth. All that AND oysters. What's not to love? I've been back since that trip and now Boston is standard anytime we are on the East Coast. This time, I was again at a lack for specific plans--save for the MFA, of course, also standard. So, I employed a little deductive reasoning which went something like, "Big city. Symphony? Boston has a symphony. Is it symphony season? Wait, Boston has the Boston Pops. (checking Internet) What's playing at the Pops today or tomorrow, the 3rd or 4th of July? ...Boston Pops on the 4th...that rings a bell. Why does that sound so familiar...? Oh, oh, wait, OMG, THE POPS ON THE 4TH? THE BIGGEST FOURTH OF JULY CELEBRATION IN THE COUNTY, THAT'S ALL! OMG, WHAT SERENDIPITY, WHAT LUCK!+! ...Well then, that takes care of tomorrow. Wonder what I should do tonight?" (In the interest of complete accuracy, I actually arrived on the night of the second, but after a full day's drive and what would have entailed a long train ride into the city (far too expensive to stay in Boston proper, and no need with their awesome T system), I opted to hike over to the local Legal Seafood and begin "Oysterfest" with all due haste. By the next morning, the pace which I set for myself must have been getting to me because I didn't get a move on until about 11 a.m. and didn't get to the museum until 2ish. Sad, because it meant a scant 3 hours to see all that I could, a small percentage of what I would have liked. Ah, but wait! Artemisia (the goddess of art, no?) smilethed down upon me. The museum was open until 7:30 for reasons I couldn't care less about. Hey, whatcha doin' up there? of steam before I ran out of time; I left a half-hour before they closed. Sorry to leave, but hungry and on the hunt for...more oysters, of course. These I found at a place noted for the variety they offered. So before bidding a fond adieu to MFA, I set my blue dot's (a.k.a. the representation of me on my iPad map app) sights on my prey. The place was so crowded (can't imagine why on the 3rd of July. It's a good thing I never remember to take crowds into account before I decide to go somewhere--I'd never go anywhere cool), I was lucky to get a seat at the bar. But there I happily sat with my water and beer and JD on the rocks and salad and dozen oysters leaving little room for the patrons to either side of me. Oh, well. I confess--if "confess" is the correct word to denote something one does which feels very right--to having an ulterior motive for wanting to be at the Pops 4th Celebration. Boston, as I've said is where I go to feel American, especially when it is where I can stand in solidarity with other Americans deeply unnerved by a recent terrorist attack. Boston, could have, would have been well within their rights to have, and in light of the fact that they'd received threats maybe should have cancelled the whole event. But then again, how could they? Bostonians, too, feel very American. It is their birthright. And as such, they feel they bear a special responsibility to show the world they will not be cowed. They also felt a special responsibility to have every conceivable branch of law enforcement--from Harvard police to the National Guard assist Boston's Finest in preventing a reprise of that tragedy. As for attendees, checkpoints controlled access to the esplanade where pockets had to be emptied (bag, backpacks, purses of any kind, and coolers with wheels (?) were strictly forbidden), people were "wanded" and wristbands were issued. I expected that attendance would be comparatively small, but having nothing to compare it to, I decided not to take any chances on getting a good seat, or rather, bit of ground and arrived just before 1p.m., six-and-a-half hours before the start of the show, my iPad and a book alone for company. What followed was the longest six-and-a-half land-based hours of my life. However, knowing that once I chose my spot, further sustenance would be long in coming, I began the day with...why oysters, of course. On the recommendation of my server of the night before, I headed to the North End to a place renowned for their oysters, only to find that, alas, they were closed for the holiday. No matter, or not much, at any rate; the restaurant two doors down boasted a selection of oysters and was open for business. I was their first customer. I ordered 2 each of 6 different types and an antipasto plate--it is the North End, after all. Happy was I to discover that by the last oyster, I had had my fill of oysters. Off to the esplanade! You already know that the festivities went off without a hitch because you heard nothing about it. Upon entering the park I was asked whether I wanted to see the show or the fireworks. "Can't I see both?" "No," the gate person responded and doing an admirable, albeit unintended, impression of the scarecrow, explained that the fireworks display was on one end of the esplanade and the show on the other. Having a presence of mind with which I surprised myself, I asked if I would be able to see the fireworks from the stage area and was told no. "Well, can I hear the music from where I can see the fireworks?" There were speakers throughout the park and so, I was told, I could. That decided that. In fact, there was a jumbotron LED screen about halfway back upon which I was able to see as well as hear the whole show. I thought it was just for the 1812 Overture, it and the cannons that boomed and reverberated to the beat. But that was just the preview, the pre-dusk appetizer, if you will. The main event was no less than 30 minutes long with illuminations I've never seen before. Smiley faces!? Clusters of lanternlike flairs hanging motionless, drifting on the wind, extinguishing themselves slowly, slowly (no shots of either, sadly; I was too mesmerized to move). Color combinations and monochromatic explosions were accompanied by a medley of songs, triumphant, sad, and grateful. Afterward, I followed the ever-attenuating crowd toward what I hoped would be a useable T station and despite a few missteps found a train that would return me to the parking garage where my car would, in turn, carry me back my dank, little chamber of a room (or so I told Jane). Farewell, Boston, heart of my American heart. Until next time.